Find out what’s happening on and off the farm with our weekly blog updates from the Huon Salmon team. 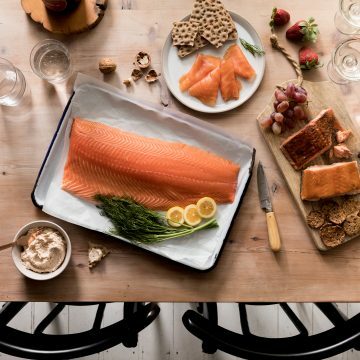 Be it opinion or lifestyle we’ll give you the low down on all things salmon. Want to know the array of health benefits that come from Huon Salmon? You’re one click away. Be inspired with our tips and tricks to take your Huon dishes to the next level. These are game changing cooking ideas. Discover restaurants serving Huon Salmon near you, or take a peak at our featured chefs and menus. From Barbecue Shapes to salmon, Tom Mitchell’s eating overhaul played a significant role in his 2018 Brownlow Medal win. Fatigue is as much a problem for the TV viewer as it is for the men and women on Rod Laver Arena, so as official salmon suppliers to the Australian Open Festival, Huon Salmon is here to set you up with an entertaining regime that will have you serving at high speeds deep into the fifth set. If you can’t tell chef Nick Raitt where your produce comes from or how it was grown there’s little chance he’ll touch it. Signup to our club for special offers, discounts and member only news.